Mylene’s breakfast spread was a bit more elaborate than the others, and the dogs joined us as we ate, which I loved. We said our goodbyes and got on the road early. Today, we decided, the toll roads would be worth it. We had a long way to go. 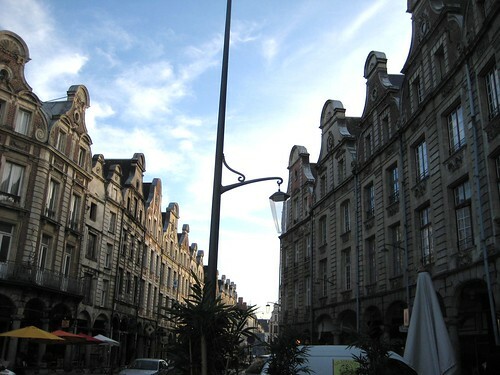 We had no plans other than to drive to Arras by dinner time, and possibly to stop somwehere in Rouen for lunch. We made such good time on the autoroute that we decided not to stop for lunch, but to punch straight through, stopping only for a bathroom break and some road snacks. We hit the outskirts of Arras before 2pm, so we decided to go visit the Vimy Memorial right away rather than drive out the next morning. A quick adjustment to Carmen and she had us there, along with a few Canadians and a boatload of kids on school visits. Note to self: stick to visiting things early or late in the day when there are no screaming tweens. The memorial was absolutely breathtaking, and the ground around it gave a hint of why that monument was there: what normally would have been rolling hills for the sheep to graze on was, even nine decades on, blistered with holes and craters from artillery. However, it should be noted that the sheep were still grazing there, which was somehow pleasing. The ground at the nearby replicas of the trenches was even more decimated, especially the three huge shell craters. Also, the woods around the site are still off-limits, as there’s a danger of stepping on unexploded artillery shells. Anyway, we spent quite a bit of time inspecting the memorial and the trenches. On the base of the memorial names were engraved of the Canadian soldiers who died in France and didn’t have proper burials, including one B.M. Dickinson. Not someone from my immediate family, but there are only so many Dickinsons in Canada. Swinging back to Arras was easy enough, but finding our hotel was quite a pain. There’s no sign or indication on the outside, nothing that could be seen from a car to suggest that it was our hotel, so we drove around looking for parking. None was found, so we parked far away, then tried again, then parked again, then finally found it on foot. Then it was the ordeal of pulling the car up on the curb, lugging all the bags in, driving down the hill to find more parking, and walking back to the hotel. There are advantages to staying in a downtown hotel, but convenient parking is not one of them. The hotel was lovely, though, less like a B&B and more like what we pictured a French hotel to be. Carrying all the heavy bags up two flights of stairs seemed worth it when I could eat a still-hot pain au chocolate sitting in the window above a busy street & plaza. That night we walked around Arras a bit, around the two main squares which had been destroyed in WWI but rebuilt later. We had dinner at a fancy brasserie on one of the squares, La Clef des Sens, which turned out pretty good. Nellie loved her meal. Mine was…interesting. I ordered a local specialty, which I learned the next morning had been tripe sausage. So, you know, that happened. Also, my chocolate mousse was maybe the richest thing I’ve ever eaten. I had to order a coffee just so the overwhelming sweetness left my mouth. Thus began my passionate week-long affair with coffee. And thus ended our evening. 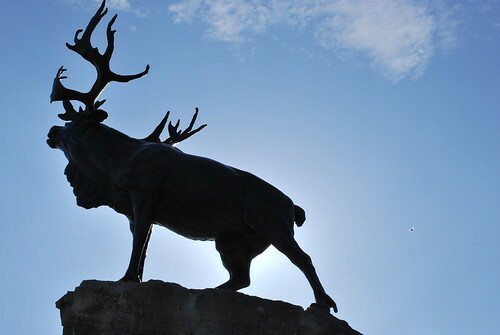 We didn’t realize until we were in Arras how close we were to another (now-)Canadian memorial site: Beaumont-Hamel. 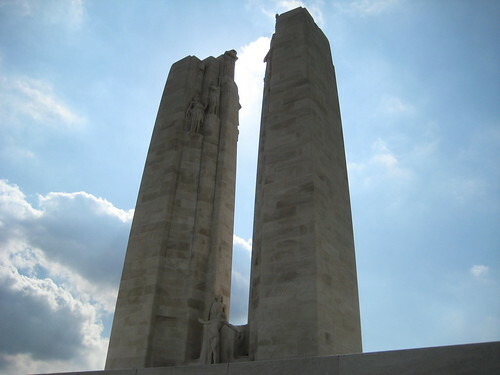 Because we’d freed up our morning by visiting Vimy the day before, we decided to sleep in and then take the slightly scenic route to Reims, passing Beaumont-Hamel. 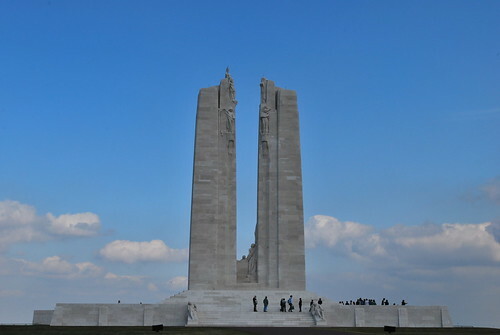 It was almost as moving as Vimy, and still had the feel of a battlefield…scarred ground, trenches, barren plain and even a replica of the danger tree. It was also the first time I realized how compact these battlefields were, and how close the trenches were. As we drove along the road south from Arras, the Somme valley was a steady sequence of memorials and military graveyards. We stopped at one large one containing many British and Australian markers, but also some Canadian. 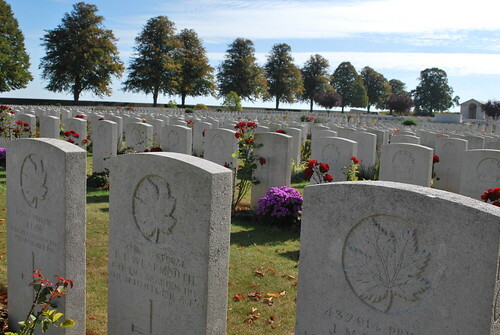 Many bore no name or nationality, but simply read ‘A soldier of the great war, known to God’. The rest of our drive to Reims was uneventful. We parked, walked down the Place D’Erlon to have some lunch (mussels and beer!) at Le Grand Café and enjoyed the sunshine. We tried visiting Taittinger but the caveau tours were finished for the day, so we retreated to the cathedral. 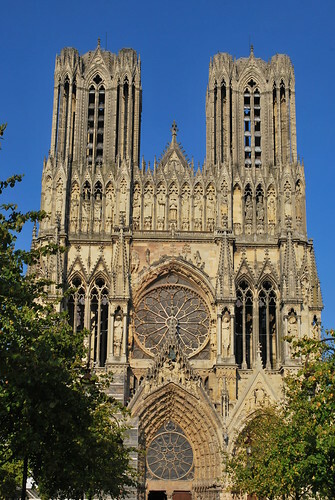 Reims Cathedral, where French kings were crowned until the early 19th century, is enormous and really quite beautiful inside. 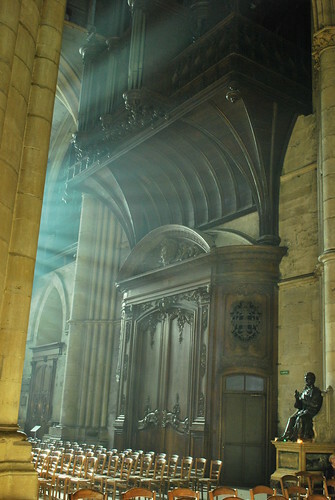 We got some good shots, especially when we both spotted the sunlight streaming into the apse. I should point out that I don’t actually know whether we were standing in the apse, I just live the word apse. We picked up supplies and left Reims, driving into the Champagne countryside. We arrived at our next lodging — Manoir de Montflambert — amidst the rolling hills covered in vines and settled in our room. It was nice to actually unpack for once…we’d been doing nothing but one-night stops, so being able to hang things and stretch out (we had a suite) felt like luxury. Oh yeah, and the mini-fridge contained five bottles of champagne when we arrived. My brother arrived several hours later after driving from London, and we sat up for a while eating, drinking and entering the usual silly zone we hit when we’re together. We all crashed at the same time, looking forward to the day we had planned.